A restaurant seeks to create an immersive experience for customers by displaying HD video on a non-conventional surface. Video of exotic landscapes is captured from a 4K input source to make the customers feel like they are sitting in a room with a spectacular view. 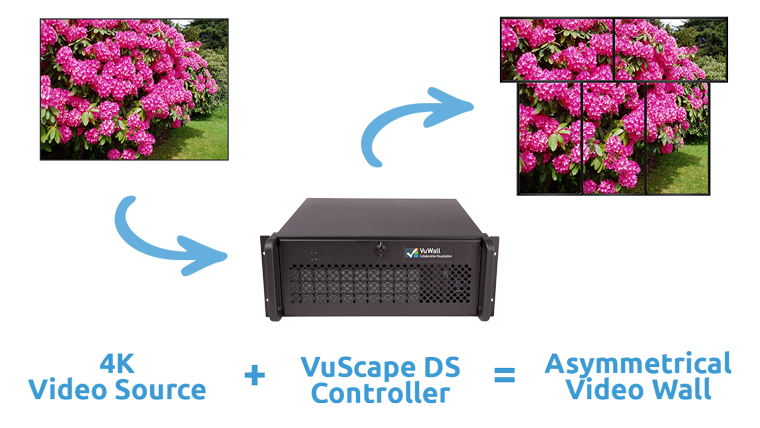 The 4K BroadSign™ media player is connected to the VuWall controller which arranges the surfaces to accurately rebuild the image across the non-rectangular array of display monitors. With the VuScape controller, the restaurant has the flexibility of a simple installation and the ability to drag-and-drop content onto the non-rectangular display surface. The end result is a spectacular portrayal of nature in the heart of a major metropolitan city, which makes this popular restaurant quite unique.